← To aero or not to aero…. Spring has sprung….. kinda sorta. Time to strip Holly! Two posts ago I talked about taking one for the team by shaving my legs to bring on spring. Yes, you’re very welcome. Unfortunately I’ve only been half-heartedly sticking to it so Mother Nature has seen fit to give us one 75° degree day followed by cold rain and snow. Okay, I’m not going to moan too loudly… we need all the wetness we can get after last year. But this is about bikes, not farms. Rando season is rapidly coming upon us. My first brevet, a 200k, happens in a week and a half. Holly the Raleigh has been stuck on the trainer for a long time and her bar tape (sorry for this) smells like concentrate of hockey locker room. This means it’s time to strip her down and give her a good bath (and a little lube). So, I took off the seatpost, all the cables and housings, the fork, bottom bracket, and everything else that attached to the frame except for the front derailleur (I didn’t want to worry with repositioning it) and the brake caliper (ditto, plus I overhauled the brakes a couple of months ago). I replaced the cables and housings, relubed everything else, retaped the handlebars, et voila! Yes, I know, the wheels are mismatched and that’s tacky. So, why would I do this? Part of it is both out of the necessity as well as the romantic notion of the randonneur. Brevets are completely unsupported. They started before the turn of the 20th century when bikes we’re huge, heavy, and fearsome, and the roads were atrocious. Some folks decided to challenge themselves by riding 200 kilometers between sunrise and sunset. Granted, it’s a lot easier now, with better bikes and roads, but it’s still a challenge. We ride on our own, with no help outside of what we find on the course, what we can secure from the riders around you (if we’re lucky) or what we can beg, borrow, or steal. So the ethos of the randonneur (or randonneuse, a woman who rides randonées) is to improvise, adapt, and overcome. 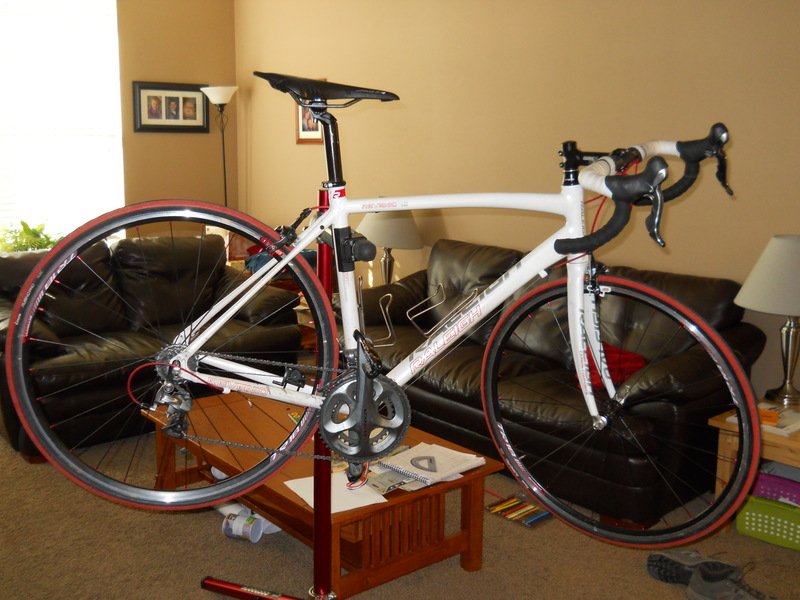 An intimate knowledge of the bike helps us to fix things or improvise them when they break on the road. I bring a spare cable on all brevets, but not knowing how to change them on any bike I might take on the road would make that cable useless. That was part of the allure of building my own wheels; it gives me intimate knowledge of how wheels work and how to fix them if a spoke breaks. That’s why I do the things that I could easily pay a mechanic to do. I’m good with my hands but the mechanics at my shop are much more experienced, and I’d trust them with my life (and frequently do). But I can’t bring them with me on the road. Even if I wanted to I can’t call them up and have them bail me out of a situation during a brevet. 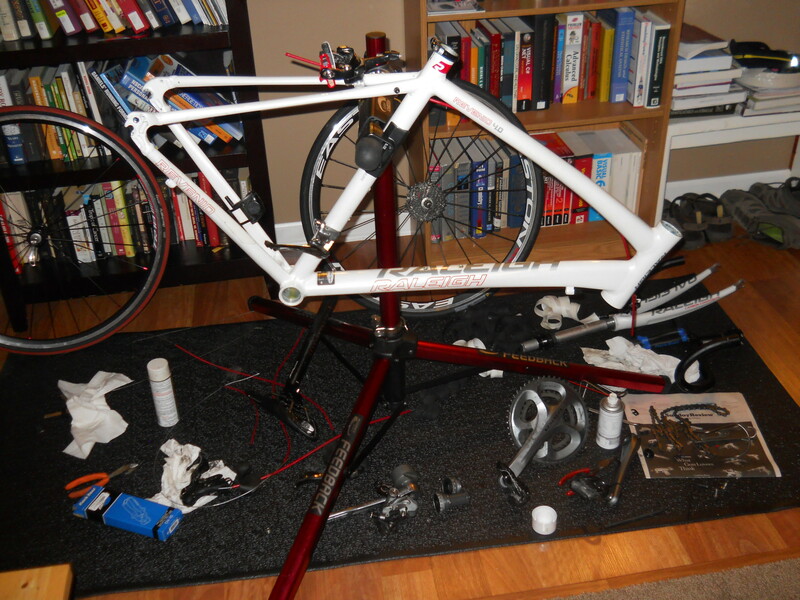 So I try to absorb as much experience as I can, doing as much as I can to get the feel for every part on my bikes. Those of you who have been following me to this point may ask, “Wait… isn’t The Beast your purpose-built randonneur?” Well, perhaps. The first one, only a little longer than a century, doesn’t necessarily require a beast of burden, so Holly would certainly be up to the task. I still haven’t decided who will be my mount for the 20th. It’s going to come down to the weather. If there’s rain in the forecast I’ll bring The Beast out to play, since Holly lacks the clearance around her wheels for fenders. If the weather is dry, Holly will be my mount for the day. I’ll let you know! This entry was posted in The rest of the stuff and tagged bicycle, bike maintenance, bike repair, brevet, cycling, randonee, randonneuring. Bookmark the permalink. 2 Responses to Spring has sprung….. kinda sorta. Time to strip Holly! 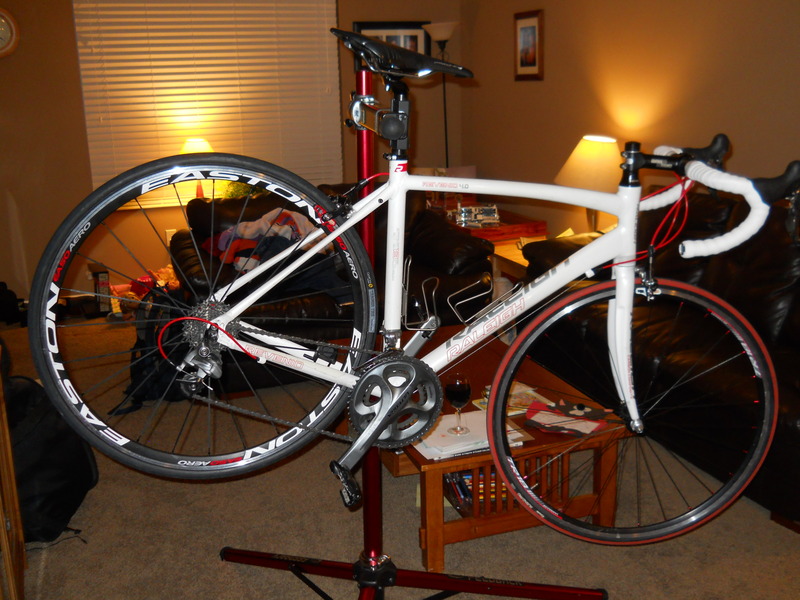 I have a dedicated rando bike, but am contemplating a carbon bike for up to 300k/400k distances. I can whip those out with relative ease and being a bit lighter will be helpful. I’m just doing the populaire in my area on the 20th, but am considering doing it fixed…we’ll see. Wow… a fixed populaire! I’m not confident enough yet in my fixie powers to manage long rides around here… it’s not that there’s a LOT of big hills. There are, in fact, not enough for me to get skilled at fixed descents but just enough to kill me trying to!